Grate ginger and extract its juice. 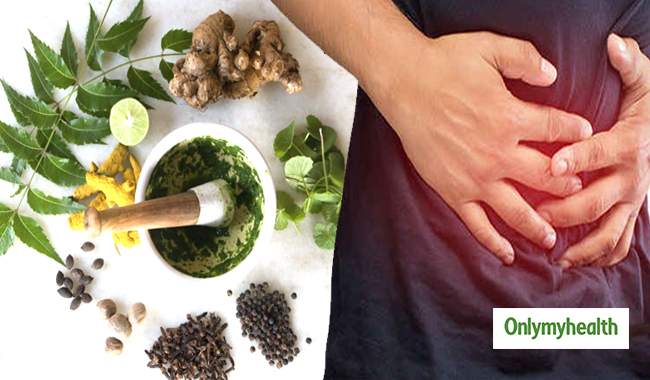 Apply the juice on your aching tummy and massage in circular motion to get relief from stomach pain. If your digestive tract functions poorly and is a reason why you have frequent tummy troubles, it’s time you to go for a walk. Be regular with the walking schedule and your digestive system will soon improve. Extract lemon, mint and ginger juice. Take a teaspoon of each type of juice, mix them and add black salt to it. Drink this mixture two times in a day to get relief from stomach ache. You may drink a glass of warm water with crushed mint leaves and ground ginger root added into it. This will bring instant relief. Lemon is a healthy herb that you will easily find in your kitchen. Squeeze a fresh lemon into a glass of water and gulp it down. Even if you don’t have stomach pain, drink lemon water on an empty stomach at least once every day. It detoxifies the body and boosts metabolism. Stomach pain usually occurs due to gastric problems caused by indigestion. Antacids that are readily available in the market can work well to relieve your condition. Antacids are available in the form of baking soda. If you are suffering from mild stomach pain, mix a teaspoon of baking soda into 120 ml of warm water and drink it. The stomach ache will soon vanish. Also read: Treat stomach problems with curd. Chamomile tea can be easily found at any of your local grocery store. Drink it twice in a day to soothe an aching tummy. It also benefits your nerves and resolves sleeping difficulties, if you have any. You may also prepare chamomile tea with dried chamomile flowers that can be found at a medical store. Avoid processed foods such as chocolates, biscuits and dairy products such as egg and yoghurt to prevent stomach ache from aggravating. Eat nutritious and healthful foods such as fresh veggies and fruits. Avoid excess of broccoli, cauliflower, cabbage and Brussels sprouts to cure stomach woes. Spicy and street foods are some other food options that may multiply stomach trouble. To prevent stomach pain from worsening, remember not to engage in heavy duty activities within one hour of your meal. Also, adding fibre in your diet will also provide much needed relief.